IGNORE AT YOUR OWN RISK! Please do not allow pride, prejudice, anything or anyone else, stop you from learning what you must know next…..Please have your Bible, (preferably the KJV), to look at the answers for yourself, so that you can see the evidence presented before you. We have tried to make this a concise study as much as possible. However, if you need further clarification on any issues, then please email us. Which Law is the Bible speaking of? COMMANDMENT 10 FROM THE TEN COMMANDMENTS! After God had audible spoken the Ten Commandments from Mt.Sinai (Exodus 20: 1-19), we see that Moses connects the transgression of the Ten Commandments to sin. Then God told Moses to come up into the mount and receive a copy of this Law. So we can see conclusively from the Bible that “sin” is the transgression of the “Ten Commandment Law” given by God Himself. Today in the Christian Churches we hear so much confusion on which Law was “nailed to the cross”. Let’s now see what the Bible has to say on which Law has been done away with. You will see that the Bible is very clear on this subject, if we allow the Bible to be the authority and it’s own interpreter. So then, how many Commandments are contained in the Ten Commandments? Does that sound like a foolish question? Then consider the fact that thousands of religious people would give an answer like “94” or “110.” You see, there is a strange belief on the part of many that the great God-written Law of the Ten Commandments was actually a part of the Ceremonial & Civil Law of Moses which contained scores of specific regulations. It is not difficult to explain what is meant by “Ceremonial Law.” In a nutshell, the Ceremonial Laws consisted of ordinances, ceremonies and sacrifices in the sanctuary system, and regulated the Priesthood. The most common instances of Ceremonial Law in the Old Testament were the regulations for various types of animal sacrifices. The Civil Laws, actually expounded on either the Ten Commandments & the Ceremonial Laws. Some were particularly adapted to conditions of rural life in Israel, while others were adapted to enabling human beings to live harmoniously together. However, many Christians do not see the Ten Commandments as being distinct and totally unique because of its divine authorship. 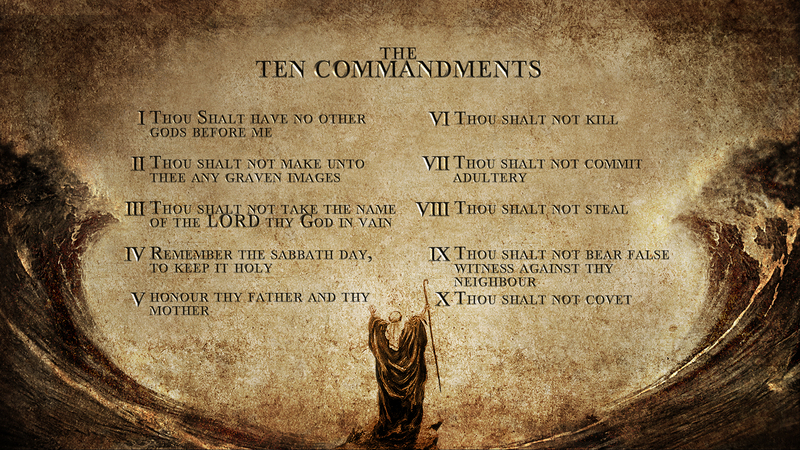 It seems quite obvious that one would effectively do away with the “Ten Commandments” by mingling them with ninety or a hundred others and calling them “ordinances” instead of Commandments. Such a radical effort has been made to dilute the force of the only words of the Bible which God wrote with His own hand. Furthermore, the claim has been advanced that since the Ten Commandments were a part of the Mosaic Law of ordinances which ended at the cross, we are no more obligated to obey the Decalogue than we are to offer lambs in sacrifice. Is there positive proof in the Scriptures that there was no such blending of the ceremonial and Moral Law into one? Can it be shown that the Ten Commandments were of a permanent, perpetual nature while the Ceremonial Law of statutes and ordinances came to an end when Jesus died? Indeed there is abundance of evidence to answer these questions with a resounding yes! “And he declared unto you his covenant, which he commanded you to perform, even ten commandments; and he wrote them upon two tables of stone. And the Lord commanded me at that time to teach you statutes and judgments, that ye might do them in the land whither ye go over to possess it” Deuteronomy 4:13, 14. “Neither will I make the feet of Israel move any more out of the land which I gave their fathers; only if they will observe to do according to all that I have commanded them and according to all the law that my servant Moses commanded them” 2nd Kings 21:8. Here we are assured that the statutes which Moses gave the people were called a “Law.” Any child can discern that two different Laws are being described. God speaks of the Law “I commanded” and also the “law … Moses commanded.” Unless this truth is understood properly, limitless confusion will result. “Yea, all Israel have transgressed thy law, even by departing, that they might not obey thy voice; therefore the curse is poured upon us, and the oath that is written in the law of Moses the servant of God, because we have sinned against him” Daniel 9:11. “And Moses wrote this law … And it came to pass, when Moses had made an end of writing the words of this law in a book, until they were finished, That Moses commanded the Levites, which bare the ark of the covenant of the Lord, saying, Take this book of the law, and put it in the side of the ark of the covenant of the Lord your God, that it may be there for a witness against thee” Deuteronomy 31:9, 24-26. “And thou shalt put into the ark the testimony which I shall give thee” Exodus 25:16. At this point we can note several distinctions in the two Laws. They had different authors, were written on different material, were placed in different locations and had totally different content! If the Ten-Commandment Law had been blotted out at the cross, would Paul have spoken in such glowing language of its perfection and spirituality? He did not speak of a past Law. He said, “the law IS holy … the law IS spiritual.” In other words, it was very much alive and operating when Paul wrote to the Roman church. In contrast he described the handwriting of ordinances in the past tense: “WAS against us … WAS contrary to us.” It is certain he was not speaking of the same Law. One was present and one was past! “Children, obey your parents in the Lord: for this is right. Honor thy father and mother; which is the first commandment with promise; That it may be well with thee, and thou mayest live long on the earth” Ephesians 6:1-3. “Circumcision is nothing, and uncircumcision is nothing, but the keeping of the commandments of God” 1st Corinthians 7:19. If the Law dealing with circumcision was now NOTHING (abolished), then what “Commandments” was he exalting as being still binding? One would have to be blind not to see two Laws here. The Moral Law remained, while the Law of circumcision (Ceremonial Law) was abolished. The truth is that there are numerous references in the Bible which prove that the Law of types and shadows, because of its temporary application, was never considered on an equality with the eternal Moral Law. Its system of sacrifices, human priesthood and feast days were instituted after sin entered the world and always pointed forward to the deliverance from sin which would be wrought through the true Lamb and Priest who was to come—Jesus. The Mosaic Law is never equated with the eternal moral code which operated from the very beginning of human history. Although they were not written down until Mount Sinai, the Ten Commandments were understood and honoured by the earliest patriarchs. Even Cain knew that it was a sin to kill, because God told him that; “sin lieth at the door” Genesis 4:7 after he murdered his brother. It is impossible for sin to exist where there is no Law! “for where no law is, there is no transgression” Romans 4:15. “Whosoever committeth sin transgresseth also the law: for sin is the transgression of the law” 1st John 3:4. “I had not known sin, but by the law: for I had not known lust, except the law had said, Thou shalt not covet” Romans 7:7. Genesis 39:9. He knew adultery was sin. “Because that Abraham obeyed my voice, and kept my charge, my commandments, my statutes, and my laws” Genesis 26:5. It is very obvious that the Law which Abraham faithfully obeyed was not the Law of Moses. Because Moses was not even born! That Law [Moses Law] was not given, until 430 years later. And we have just established that the Ten Commandments existed before Abraham, condemning even Cain for murder. The context of this verse indicates that Paul is talking about the Ceremonial Law rather than the Moral Law of the Ten Commandments. In verse ten, he refers to the curses “which are written in the book of the law.” We know this had to be the Mosaic Law because, as we have already noted, there are no curses recorded in the Law written on stone. Here we have two significant facts set forth concerning the Law which was added. We are told why it was given and also how long it would remain in effect. These two bits of information will be considered very carefully since they contain compelling evidence in the case. FIRST: WHY WAS IT GIVEN? The verse clearly states that it was “added because of transgressions.” This is most revealing because we have just established that “where no law is, there is no transgression” Romans 4:15. One can’t be guilty of transgressing a Law which does not exist. In this case one Law obviously did exist; and it had been “transgressed,” making it necessary to add another Law 430 years after God’s covenant with Abraham. And since it is recorded that “Abraham obeyed … my laws” Genesis 26:5, we have to believe that the earlier Law, which Abraham observed, was the Ten Commandments. Moses had not yet been born, and it could not have been his (Moses) Law. So what must we conclude from this evidence? The Ten Commandments had been transgressed, making it necessary to add the Ceremonial Law. Upon reflection, this makes a lot of sense. If a Law is made forbidding murder, and it is broken, then another Law would have to be enacted to prescribe the penalty or punishment for breaking that first Law. We have already established that the Ten Commandments contained no curses (penalties) or judgments (punishments), but the Mosaic Law was characterized by those very things. SECOND: HOW LONG DID THIS “ADDED” LAW REMAIN IN EFFECT? The Scripture says, “Till the seed should come.” Galatians 3:19. There is no controversy over the identity of that seed. It is Christ. But do we have evidence that the Law which was blotted out and nailed to the cross was indeed the Law of Moses? Whichever Law it was, it is designated as the “handwriting of ordinances.” Colossians 2:14. Nowhere are the Ten Commandments identified as ordinances. That term is applied to local legal codes which are very narrow and limited, such as “town ordinances” which extend only to the city limits. In comparison, the Ten Commandments are more like the constitution of the United States. THE CEREMONIAL LAW WAS BLOTTED OUT! continued…. Now we begin to see clearly which Law was under discussion. Is there anything in the Ten Commandments about meat and drink? “Let no man therefore judge you in meat, or in drink, or in respect of an holyday, or of the new moon, or of the sabbath days: Which are a shadow of things to come; but the body is of Christ” Colossians 2:16, 17. Question: Could these Sabbath days be talking about the Seventh-day Sabbath of the Ten-Commandment Law? No. Because they are clearly defined as “shadow of things to come.” Please keep in mind that the weekly Sabbath was instituted by God before sin came into the world (Genesis 2:2-3). THERE COULD NEVER BE TYPES OR SHADOWS BEFORE SIN EXISTED! All the shadows were introduced after, because of sin and pointed forward to the deliverance from sin through Christ. For example, all the lambs slain represented Jesus, the true LAMB, who would die for the sins of the world. If sin had not entered the world, there would have been no need of a Saviour, and therefore, no lambs or shadows pointing to a Saviour. So these “sabbath days which are a shadow” could not possibly be referring to the Seventh-day Sabbath. But what other Sabbaths could they be talking about? Were there “Sabbaths” other than the weekly Sabbaths? Yes, there were yearly Sabbaths which had absolutely nothing to do with the Seventh-day Sabbath of the Decalogue. And they were definitely a part of the “ordinance” system which ended at the cross. “Speak unto the children of Israel, saying, In the seventh month, in the first day of the month, shall ye have a sabbath, a memorial of blowing of trumpets, an holy convocation” Leviticus 23:24. “Also on the tenth day of this seventh month there shall be a day of atonement … It shall be unto you a sabbath of rest” (verses 27, 32). 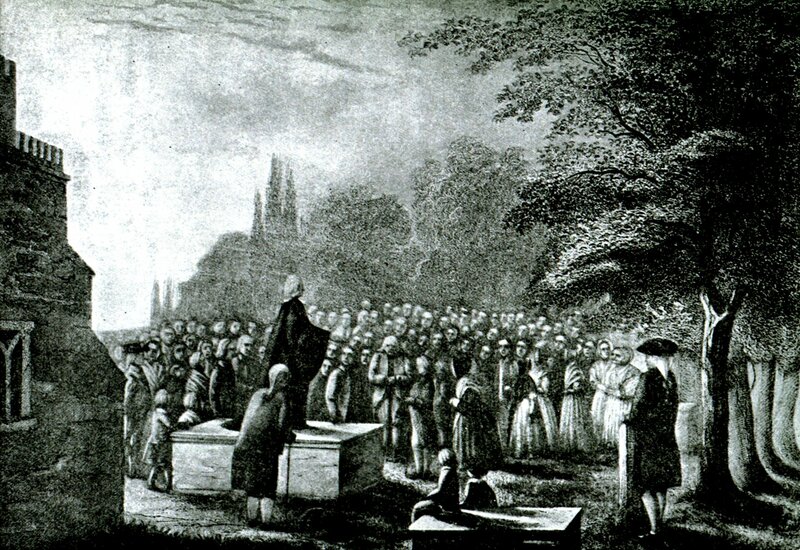 “These are the feasts of the Lord, which ye shall proclaim to be holy convocations, to offer an offering made by fire unto the Lord, a burnt offering, and a meat offering, a sacrifice, and drink offerings, everything upon his day: Beside the sabbaths of the Lord” (verses 37, 38). Now we can understand what Paul was referring to in Colossians when he wrote about meat and drink and Sabbath days which are shadows. There were certain prescribed offerings for each of those yearly feast days, and they were shadows pointing to the future sacrifice of Jesus. But the Bible says these were “BESIDE THE SABBATHS OF THE LORD,” or the Seventh-day Sabbath. Please read through the whole of Leviticus 23 and see. You will clearly see the meat & drink offerings & the yearly Sabbaths all outlined. Now it is fully established which Law was blotted out and nailed to the cross. At the moment of Christ’s death, the veil of the temple was ripped from top to bottom by an unseen hand (Matthew 27:51). The Most Holy Place of the Sanctuary was exposed where the sprinkled blood recorded all the sins of the people. But no more blood needed to be sprinkled; no more lambs needed to be slain; the true Lamb had come to which all those sacrifices pointed. From henceforth, it would be a denial of the Saviour to bring animals. It would be denying that He was the fulfillment of all the shadows and types. Therefore, it would be “against us” or “contrary to us” to continue observing that Mosaic Law. Now let’s ask another question: On the day before Jesus died, was it a sin to steal? Undoubtedly it was. On the day after He died, was it a sin to steal? The answer is yes; it was just as wrong as the day before He died. Obviously, all the blotting out of ordinances, types and shadows did not affect the great moral code of the Ten Commandments in the slightest degree—they all applied afterward as much as before Christ died. The truth is that all men will be judged on the basis of that eternal code which forms the foundation of God’s government. “For whosoever shall keep the whole law and yet offend in one point, he is guilty of all. For he that said, Do not commit adultery, said also, Do not kill. Now if thou commit no adultery, yet if thou kill, thou art become a transgressor of the law. So speak ye, and so do, as they that shall be judged by the law of liberty” James 2:10-12. Do not by any means miss the tremendous truths contained in these verses. This is the Law we will be judged by! Which Law is it? James leaves no room for doubt. He quotes two of the Ten Commandments. But notice how he defines this Law as a complete unit in itself. He states that we are responsible for keeping “the whole law.” How many Commandments are contained in “the whole law”? Exactly Ten! What do we become if we break any one of the Ten? “A transgressor of the law,” James answers. And that is what sin is called in the Bible. “Sin is the transgression of the law” 1st John 3:4. Why did Jesus come? “Thou shalt call his name JESUS: for he shall save his people from their sins” (Matthew 1:21). Notice that Jesus came to save us from breaking the law, but “… if any man sin, we have an advocate with the Father, Jesus Christ the righteous” (1st John 2:1). WHAT DID JESUS SAY ABOUT THE TEN COMMANDMENTS? “He that saith I know him and keepeth not his commandments, is a liar, and the truth is not in him.” 1st John 2:4. Friend, Gods Holy Law, the Ten Commandments are still as relevant today as yesterday. They HAVE NOT been done away with. Including the Sabbath Commandment. “sin is the transgression of the law” 1st John 3:4. “The earth mourneth and fadeth away, the world languisheth and fadeth away, the haughty people of the earth do languish. The earth also is defiled under the inhabitants thereof; because they have transgressed the laws, changed the ordinance, broken the everlasting covenant. Therefore hath the curse devoured the earth, and they that dwell therein are desolate: therefore the inhabitants of the earth are burned, and few men left”. God’s Law is broad & covers every aspect of life. They are for our good! The plain fact is, if people kept the Commandments of God, then there would not be any misery on this Earth. In fact our wrong-doings (sins) have far reaching consequences than many people realize (Ecclesiastes 9:18). The central theme of the Bible is the total eradication of sin, which is the redemption plan, & the restoration of the image of God in the human soul, which are the Ten Commandments, the transcript of Gods character.